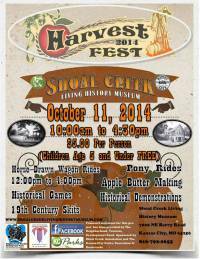 On Saturday, October 14, 2017, the Shoal Creek Living History Museum is holding a Harvest Festival. Admission is $5. Kids 5 and under are FREE. This event, which runs from 10 a.m. to 4 p.m., includes historical games, 19th century re-enactors, skits, demonstrations, music, face painting, kettle corn, pony rides, pumpkins for sale, horse-drawn wagon rides ($1), concessions, and more. The Shoal Creek Living History Museum is located at 7000 Northeast Barry Road in Kansas City, Missouri.